Before I went off to uni 4 years ago, my mother wanted me to “observe” her cooking so that I’d be able to manage while I was away. As I watched her add this spice, and that herb, and this something and that other thing, it all seemed rather daunting and I told her no, that’s far too much work. Little did I realize that once you actually start cooking, adding this, that and the other, becomes a breeze. At the heart of Sri Lankan cuisine are its spices; fragrant cumin, fennel and cinnamon, turmeric, cloves, spicy chillies and citrusy ground coriander. Sri Lankan cooking also uses a lot of coconut milk, the consistency depending on personal choice. One of the most common dishes you’d find during a meal: breakfast, lunch or dinner, is dhal. Dhal is a common dish within the subcontinental region of Sri Lanka, India, Bangladesh and Pakistan, but differs in the spices used and method of preparation. Sri Lankan dhal curry is traditionally made using the red-orange Mysore dhal variety, and is one of the easiest dishes to make and add to your Sri Lankan repertoire. In a skillet, heat about 1 tablespoon of oil and saute the onions and garlic and ginger paste, until fragrant. Then add the mustard and cumin seeds, frying until they begin to “pop”. Add in the curry leaves, dried chillies, turmeric, chilli powder and fry for about 30 second. Add in the soaked dhal and add enough water to cover the dhal. Cover and cook for about 10 minutes, or until most of the water has been absorbed and the dhal is tender. At this point, add in the coconut milk and mix well. Cook uncovered for about 5 minutes, until the curry thickens. You may add the chopped coriander, stir well for a minute and take it off the heat. On a side note, here in Sri Lanka, we also tend to cook the dhal without the onions, mustard seeds and dried chillies, opting to fry those separately and add it over the cooked dhal, towards the end. The cumin seeds (thanks Mateen!) and coriander are slight influences from India, but I’ve found they add great flavour to the dhal. You may garnish with a sprig of coriander and its ready! Simple! 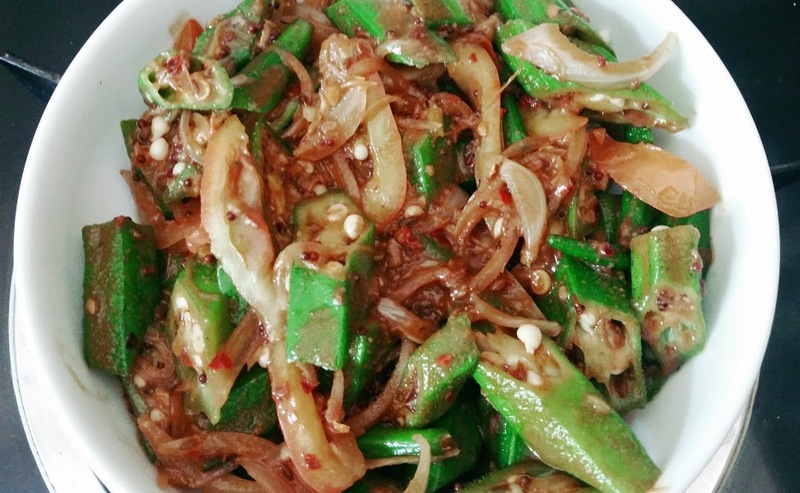 The second dish on this post is stir-fried okra or ladies fingers. In Sinhalese, it is referred to as Bandakka (okra) thel dala (stir-fried). In a pan, add 2 tablespoons of oil (any oil would do. I usually use olive/ sunflower oil) and saute the onions, garlic and ginger, chillies and curry leaves. Add all the spices, save for the garam masala, and fry for a minute. Add in the okra and mix well. Cook on a medium heat for about 5 minutes, or until the okra is tender, yet crunchy. You could add in a dash of water to help with the cooking process. I love you. Omg. I’m your biggest fan.